Dogs can often be more sensitive to their diets than we may initially suspect. We see our pets greedily wolf down the food placed in front of them and appear to enjoy it, but when they break out in itchy skin and other sign of allergic reactions, we tend to assume that it is some environmental factor or other health issue. The truth is that pets tend to manifest allergic reactions to their food through their skin. Change their diet with some hypoallergenic alternatives and you could help to reduce the problem. This guide will look at some of the best dog food for skin allergies. Try and reduce the amount of ingredients your dog is eating to track down the issue. It can be a good idea to try and work on a more minimalistic diet plan once you start to notice that you pet is developing irritations and skin problems. This can not only keep you to cut out some of the less important food sources that may be causing the effects, but to also let you pin point the precise food stuff that is causing this bad reaction. Some say that blaming allergic reactions on additives is a bad approach because although its sounds likely and there is a case for opting for a simplistic, natural diet, the problem often tends to lie elsewhere. The following options provide a simple formula that may help skin allergies. *Above all the ratings are given by our editors or authors based on their experiences. Click on the product name to check the price on amazon. Purina is a name familiar with dog owners and often cited by veterinarians as a must-have choice for pets with specific health conditions. This Pro Plan “sensitive skin and stomach formula” is designed to help allergic dogs in a number of ways and uses a simplistic ingredients list with no wheat, soy or artificial additives. The protein comes from salmon that is rich in omega-6 and this, plus the zinc content, ensure that the health of the dog’s coat and skin should improve. The “filler” material here is harmless rice and oats. 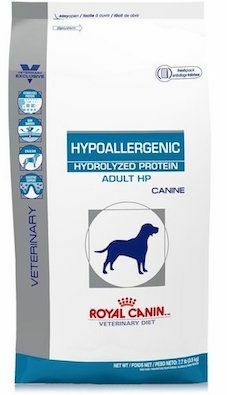 This is another brand that is seen a lot around the vet’s office and this specifically hypoallergenic option is also clinically recommended for the simplistic formula and the way that it is designed to target all sorts of health issues. The problem with this food is that is can seem a little bland, especially compared to some of the options below. It uses hydrolyzed soy proteins, rice and plenty of vitamins and minerals to ensure a healthy digestive system, better skin and shinier coat. It is basic, but it seems to have a great impact on the health of dogs. There are also certain food substitutions that can be made that can really make a big difference for canine allergens. There are certain foods that dogs can be prone to having an allergic reaction to, so it can help to simply cut these foods out of the diet entirely. Some dogs will find themselves to be gluten intolerant, which means that any sources of wheat and grains should be removed from the diet. Many of the top, simplistic dog foods for allergies tend to go grain-free to avoid any risk of stomach upsets. Dairy is another potential problem with dogs and the biggest concern here is where dog food manufacturers use eggs within their formulas. The final problem, and the one that it easy to overlook, is the source of meat. Chicken and beef are the obvious meat sources for many dog owners because they are rich in proteins, tasty and cheap. The problem is that some dogs can be allergic to either, or perhaps both. The solution here is to go for a fish-based formula that is rich in omega oils or a completely different meat altogether. The following options are great for a better source of protein. This is one of the more obvious options for anyone looking to substitute the met in their dogs diet for fish because of two important reasons. Firstly, this mixture comes from one of the most highly rated companies that are around right now. Secondly, it has 6 different Canadian fish in the ingredients list. Buyers love the use of real, wild-caught fish in this product and the lack of any problem ingredients like grains and dairy. The other 20% of the formula comes from fruits and vegetables. The protein rich fish is ideal to help with the condition of the skin and coat. This option is a little unusual, but could prove to be a big hit with dog owners that have struggled with other recipes and meat sources. Kangaroo has the richness and flavour of a real meat, but is less likely to cause any problems. 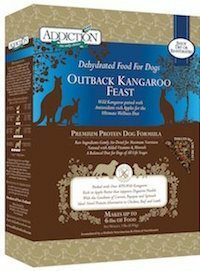 This product is the first to use raw dehydrated kangaroo and can be used as a dry or rehydrated wet mix. The additional ingredients are an odd blend of vegetables and fruits – like apples and spinach – as well as seeds and potatoes. This is not a simplistic, hypoallergenic option that your vet may recommend, but many owners are impressed with the difference it can make and the quality. Always seek the advice of your vet and be prepared to take things slowly when finding the best dog food for skin allergies. You are not likely to see immediate effect overnight with these dietary switches but if you keep an eye on the intake of your pet and the quality of their coat and skin, you should soon be able to tell if the change in ingredients is having an effect. If not, try something new. At all times, stay in contact with your vet as they can help to diagnose the condition best and to advise you on any products they feel are best suited for the problem. Some criticise the vet’s choice products as being too expensive, but it is often possible to buy them at a better price online and it is better to pay a little more money for a dog food you know is a healthy option. Be patient with your pet, ease them into changes slowly and listen to what they are telling you – both in their love or distaste for the flavours and the reactions in their coat and fur. Like this guide? You may like these guides on best dog food for Pitbulls or best dog food for Boxers.